This article going to show you how to setup automated installation for Linux distros (RHEL, Fedora, CentOS), similar to how we deploy our Windows installations via PXE. This article wont cover the initial WDS installation process. Windows server running WDS (and working via DHCP). A recent copy of SYSLINUX (extracted to a folder somewhere on the WDS server). An HTTP or anonymous FTP server to hold your installation media. Currently when I boot my computer with PXE enabled, I am prompted to hit F12 for network boot. When I press F12, I am prompted by “Windows Boot Manager” to select my boot images that I setup in WDS. Since I can’t install Linux images directly using the WDS interface, an alternative boot image is necessary. That is where SYSLINUX/PXELINUX takes over. 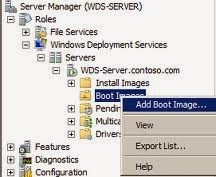 Create the necessary directory structure inside the WDS RemoteInstall directory (this was specified during the WDS installation). Setup an FTP server to hold your installation media (HTTP works also): Currently the average size of a Red Hat distribution is about 5GB, so make sure the server you select will have the necessary disk space. You will need separate installation media for both distribution specific 32bit and 64bit installs. If you want Fedora 9, CentOS 5.2, and RHEL 5.2 images (both 32bit and 64bit), that will be about 30GB. As long as you’re not archiving old distributions, this should not be an issue. On my FTP server in the root/path, I created a directory for each of my installation media. Also, creating a standard naming convention will help with editing the configuration files later and any case sensitivity issues. Example: My directory names are DistroVersion_arc (Fedora9_32bit), as you will see later on. Copy the entire installation dvd media to the corresponding directories you created (not the .iso, extract its entire contents). In the FTP root directory for the media you copied, create a kickstart file (ks.cfg). (Example: ftp://ftpserver.domain.com/Fedora9_32bit/ks.cfg) I have included example kickstart files at the bottom of this article. Once you have copied the installation media for a distro to your FTP server, you need to copy 2 files from that specific distro media to your WDS server. Copy vmlinuz to the following directory on the WDS server (RemoteInstall\Boot\x86\knl\). Rename the file to an identifying name such as vmlinuz-fedora9-32bit. Copy initrd.img to the following directory on the WDS server (RemoteInstall\Boot\x86\img\). Rename the file to an identifying name such as initrd-fedora9-32bit. When it comes time to configure your option menus, you will need to specify these files for each version/distro you plan on making available. pxelinux.0 from the (syslinux\core) directory to your (RemoteInstall\Boot\x86\) directory on the WDS server. menu.c32 and vesamenu.c32 from the (syslinux\com32\menu) directory to your (RemoteInstall\Boot\x86\) directory on the WDS server. Lastly, set WDS to use the pxelinux.0 boot image. If you need to get to the normal WDS boot image, you can use the Windows Installer option created in your default menu. Open Windows Deployment Services on your WDS server. Right click your server -> Properties. Under the Boot tab, set the Default boot program for x86 architecture (Boot\x86\pxelinux.0), or browse to the pxelinux.0 file we created earlier. You may leave the other architectures alone or change as you see fit. Here is an example kickstart file for Fedora 9. For each new distro I normally perform a cd install with my desired options, then use the resulting /root/anaconda-cfg.ks for assistance. Note that the kickstart file specifies the FTP path of your installation media that you created in the beginning of this article.